But they're bringing me packages! 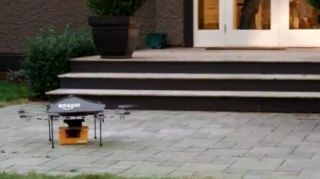 Call it the future or a clever marketing ploy, but Amazon's Prime Air octocopter delivery system is the talk of the web. It's also already the talk of privacy advocates - US Senator Edward Markey has issued a statement urging the Federal Aviation Administration to set up privacy regulations before drones begin dropping parcels. "Before drones start delivering packages, we need the FAA to deliver privacy protections for the American public," Markey said in a statement. "Convenience should never trump constitutional protections." The senator has previously introduced legislation to guard against spying on US citizens by drones. Even though Amazon's unmanned delivery machines are still some years away (and would have to comply with FAA rules anyway), privacy concerns are an important wrinkle Amazon will have to iron out. Not to mention the seemingly inevitable impulse to steal the damn things. Our blips are coming in for a landing.